Last Saturday I was feeling lonely because my hubby was away, my friends were camping or otherwise occupied, and I needed a little inspiration for my house and garden. I’ve also been trying to do something creative other than writing to, as my husband says “keep my saw sharp.” We writers need to use our creative energy in more than one way to keep the creative juices flowing. Since the main character in my book is also a gardener, I thought getting back into gardening would not only be good for my creative spirit and let me feel some of what Faith feels, but it would also be a good way to be active, a real challenge when I sit so much at my desk writing. It is definitely a workout. I use to really enjoy gardening, but the past few years I’ve been overwhelmed with the amount of work I need to do, and I’ve been lazy and uninspired. We have lived in our house now for nearly ten years, and all our landscaping needs overhauling. After a time, shrubs reach their full height and need radical trimming or removal, perennials need dividing–especially when you neglect doing that year after year, and some overzealous plants reproduce and take over–Siberian irises anyone? That’s where my gardens stand right now. I’d really like to pay someone to come in and redo everything, but who can afford that? 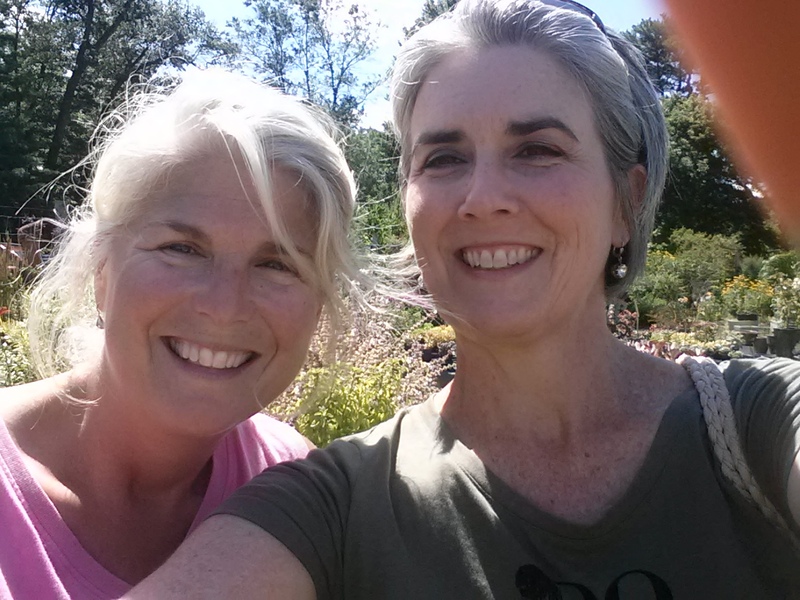 That’s why on Saturday, August 1, I went to visit my friend Shelly Christie, the owner of Graziano Gardens. That’s us: she’s in pink looking lovely even in the heat! People display their creativity in numerous ways, and I’m glad Shelly lets her creativity shine in the garden. You can see it even in my less than stellar photography. Last Saturday was the first in her new Super Saturdays at Graziano Gardens. 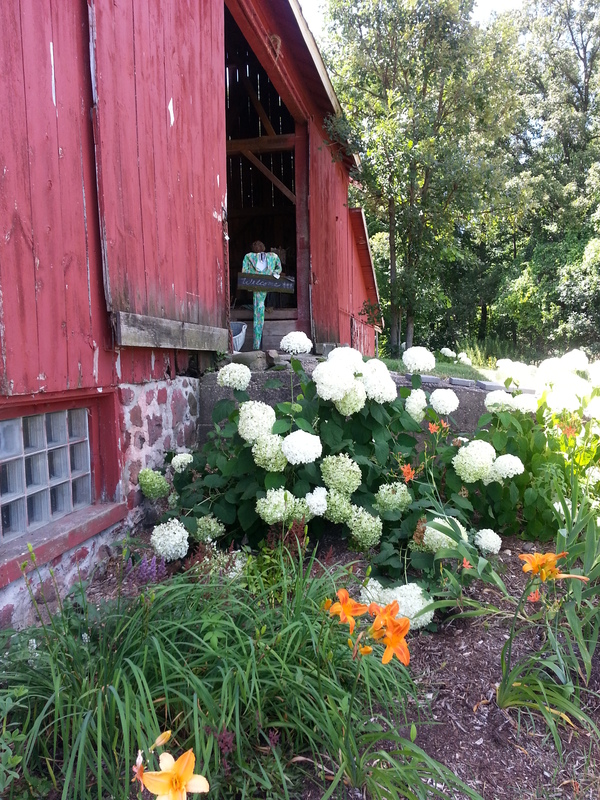 I visited to get some inspiration for planting and also to go to the Barn-tique sale–the barn on the property has all kinds of antiques and collectibles to restore and up-cycle into some new treasure for your house or garden. Pinterest anyone? 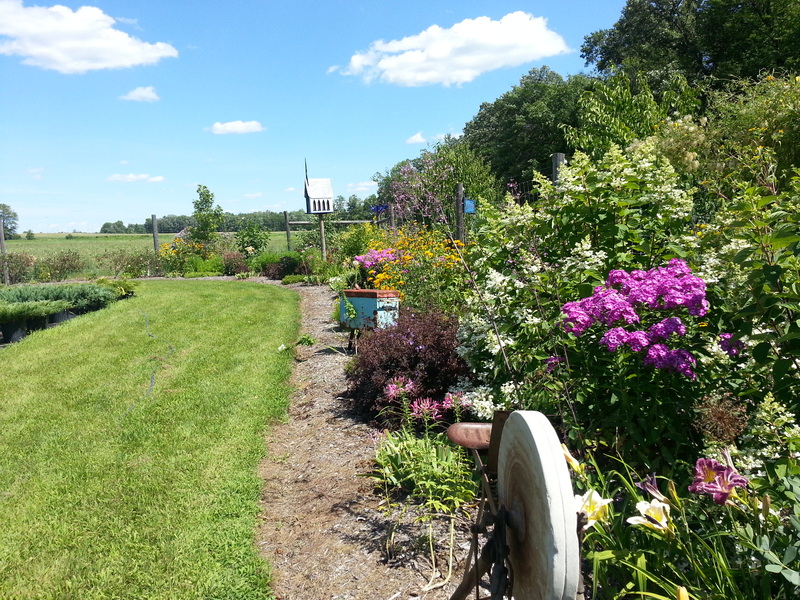 In addition, I listened to the very knowledgeable Rob Zimmer discuss gardening and designing with native plants. Rob is a columnist for the Appleton Post Crescent and is also known as the Yard MD. 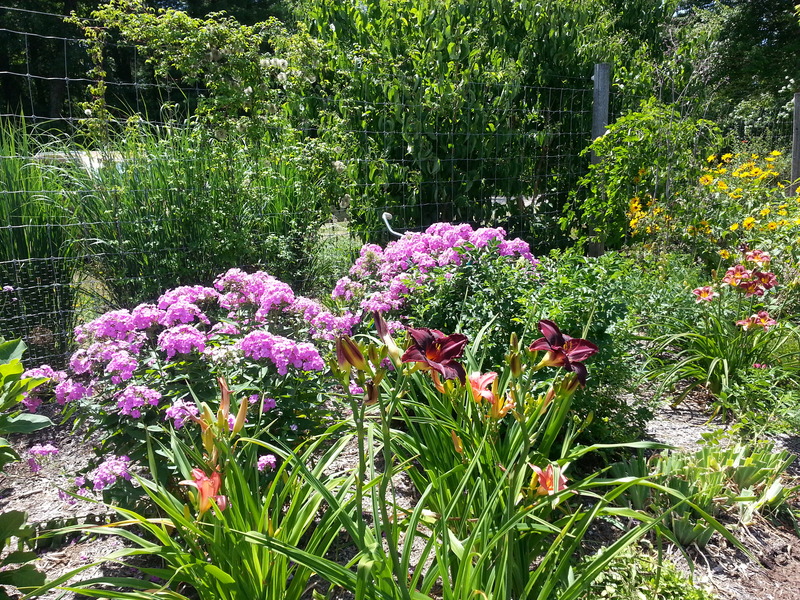 I did get some inspiration for next spring, but still have too much to do with what I already need to divide and move to buy anything else, except for two daylilies–there is always room for more daylilies, and Shelly had some beauties. I purchased two called Pardon Me (love the name!) miniatures with cranberry red flowers with green throats. They are re-bloomers too. I can’t wait to get them in the ground. Today, I promise. If you need an injection of creative inspiration and haven’t been to Graziano Gardens yet or haven’t been in a while, I urge you to go. 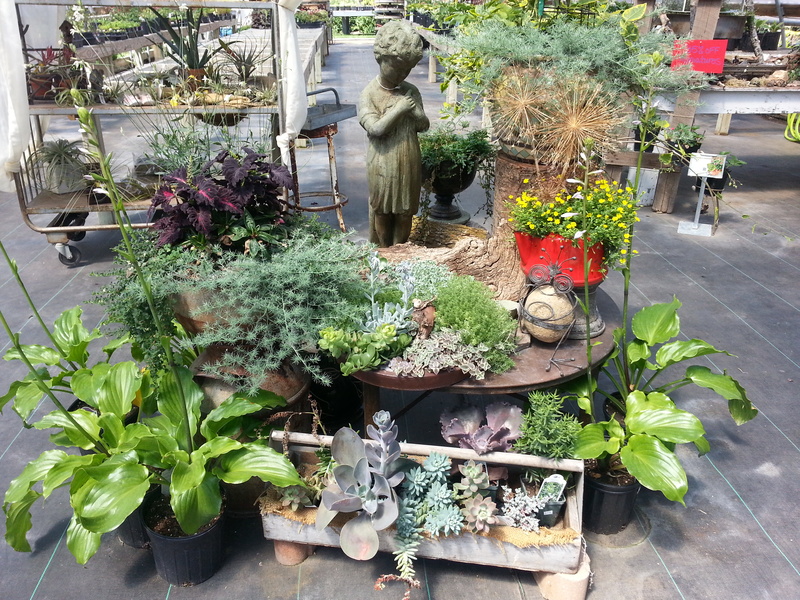 The gardens surrounding the garden center will inspire you as will the numerous plants and pots for sale. Shelly and her crew are wonderfully helpful and friendly! Also mark your calendars for the next two Super Saturdays this fall. The weather will be cooler, perfect for gardening. Here’s the info! I hope to see you there! Barn-tique Open 9 a.m. – 5 p.m.